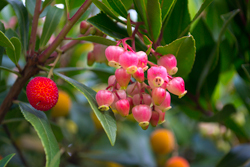 This month's star performer in our garden is the Strawberry Tree - Arbutus unedo. It is more a large evergreen shrub than a tree, and since the beginning of October has looked absolutely stunning! It is unusual in that it flowers and fruits at the same time - last year's flowers are this year's fruits. The fruit starts off yellow, before changing to orange and then finally to red - if given the chance, as they are blackbird magnets! Meanwhile, the racemes of white and pink lily-of-the-valley type flowers, are adored by butterflies and bees alike. Still flowering during the second week of November, this shrub is providing valuable autumn food for them. An attractive architectural plant, the oval leaves are glossy and serrated, contrasting with the reddish brown ornamental bark. 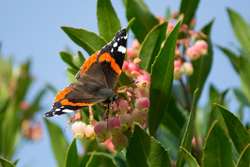 Although a member of the Ericaceae family, it is tolerant of limey soil. It likes to be in the sun, and although it prefers sandy soil, is growing quite happy in our heavy clay soil. There are divided opinions about removing dead leaves from the garden, one side stating they provide shelter for insects to over-winter in, whilst the other side complaining they harbour slugs. Having spent most of the summer removing slugs from my plants, I favour removing leaves and dead foliage! However, I do provide insect homes around the garden instead. Once annual bedding plants have finished flowering they can be pulled up and added to the compost heap. Perennial plants that are looking particularly untidy or have yellowing foliage, can be cut back. However, even perennials without flowers have a certain aesthetic value during the winter so it's a good idea to leave some standing. Seed heads can add architectural interest, especially with a touch of frost or dusting of snow on them. Whilst the seed heads of flowers like Echinacea (coneflower), Sunflowers and Eryngium (sea holly) will provide food for seed-eating birds. Even the delicate looking steams of Knautia macedonia support the goldfinches who love the fluffy seed heads. Tender plants like penstemons should not be cut back until the risk of frost has passed in the spring. If you only have a small number of leaves to deal with, you can simply add them to your compost bin with other garden waste where they will balance out the soggy material like grass cuttings. For larger amounts of leaves, it’s beneficial to collect and keep them separate in order to make leaf mould, a valuable commodity for any garden and often called Gardener’s Gold. All types of leaves from deciduous trees can be used, although some thicker leaves like horse chestnut and sycamore will take longer to rot down. Do not use evergreen leaves like holly or conifer. Gather the leaves using a brush, lawn rake or leaf vacuum. 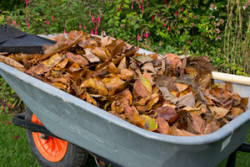 The easiest way to collect fallen leaves from lawns is to use your lawn mower. This has the added advantage of shredding the leaves and helping them rot down more quickly. Place the leaves into a plastic sack, water them if dry. Tie the bag loosely and make a few holes in the bottom for drainage. Place in an out of sight corner of your garden and forget about them for a year or two. If you have a larger garden and more leaves to collect, then make a simple leaf cage in an secluded spot, using plastic or wire netting with some supporting stakes, to a size that suits the amount of leaves you have. Then add the leaves to the leaf cage and remember to water during dry spells, and wait. Fresh urine is said to speed up the process! After about a year, the leaves will have rotted into a rich, crumbly mixture and can be used to mulch around shrubs or dig in to the ground as a soil improver. When leaf mould is well rotted, a black, crumbly consistency, with no trace of the original leaves, it can be used as a mix for seed sowing.